2 May 2018, at 12:00a.m. Lugar, currently serving as president of The Lugar Center, a Washington, DC-based non-profit organisation focusing on global food security, WMD non-proliferation, aid effectiveness and bipartisan governance, emphasised the important role of research and education in fighting global hunger. Lugar was joined on the panel by Sylvie Brouder, professor of agronomy; Gary Burniske, managing director of the Purdue Center for Global Food Security; Indrajeet Chaubey, professor of agricultural and biological engineering; Gebisa Ejeta, Distinguished Professor of Agronomy and 2009 World Food Prize laureate; Thomas Hertel, Distinguished Professor of Agricultural Economics and founder and executive director of the Global Trade Analysis Project; and John Lumkes, professor of agricultural and biological engineering. Karen Plaut, interim dean of the College of Agriculture, hosted the panel. 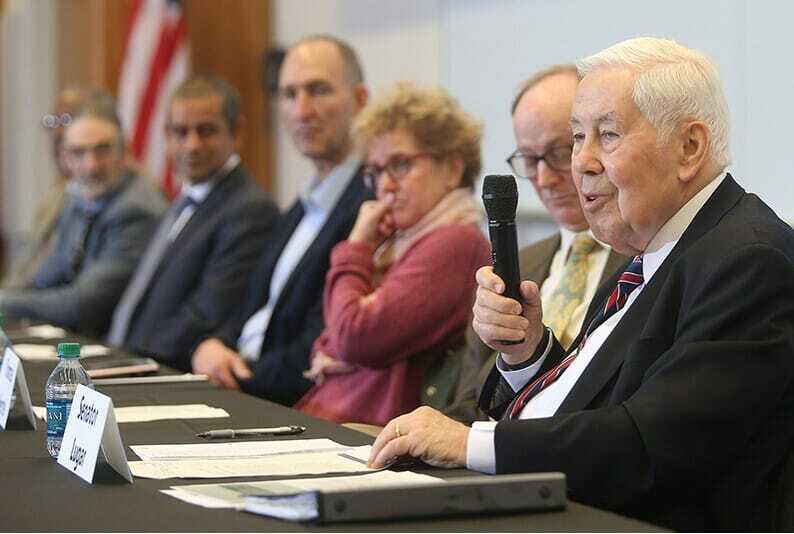 Former US Senator, Richard Lugar of Indiana, joined six Purdue University faculty and staff members 30 April for a roundtable discussion on global food security. The discussion was hosted by Karen Plaut, interim dean of the Purdue College of Agriculture. (Purdue Agricultural Communication photo/Tom Campbell). Panelists addressed the complexity of food insecurity and its relationship to economic, political, geographic and cultural factors. Ejeta noted that roughly 800 million people around the world experience food insecurity, many of them children. He stressed that the issue must be addressed across disciplines. “There is not a better model for the transdisciplinary approaches than the land grant university model of education, research and Extension,” he said. Brouder said developing new technologies was not enough – those technologies had to be practical and useful for producers around the world. “Part of our role as a land grant university is to identify the technologies that can be adopted and show how they should be adopted,” she said. Following the panel discussion, Lugar continued his campus visit with a tour of the Purdue forestry and natural resources farm that bears his name. The Richard G Lugar Forestry Farm was named in 2014 to honour the former senator’s longstanding commitment to science-based advances in forestry. The 175-acre farm promotes production of improved hardwoods to benefit Indiana’s vital forest products industry. It operates primarily under the auspices of the Purdue Hardwood Tree Improvement and Regeneration Center, which Lugar helped create.